11 artistic attributes that address the potency of creative expression to embody and motivate change. Aesthetic Perspectives aims to inform and inspire reflection, dialogue, and rich description in use by artists, funders, evaluators, educators, critics, presenters, programmers, curators, and audiences. Offers a SUMMARY of the 11 attributes and rational and context for the framework. Written by respected peers, Companion guides for: Artists, Funders, Evaluators, Educators, and Curators offer ideas and insights to help these users APPLY THE FRAMEWORK to address their needs and interests. 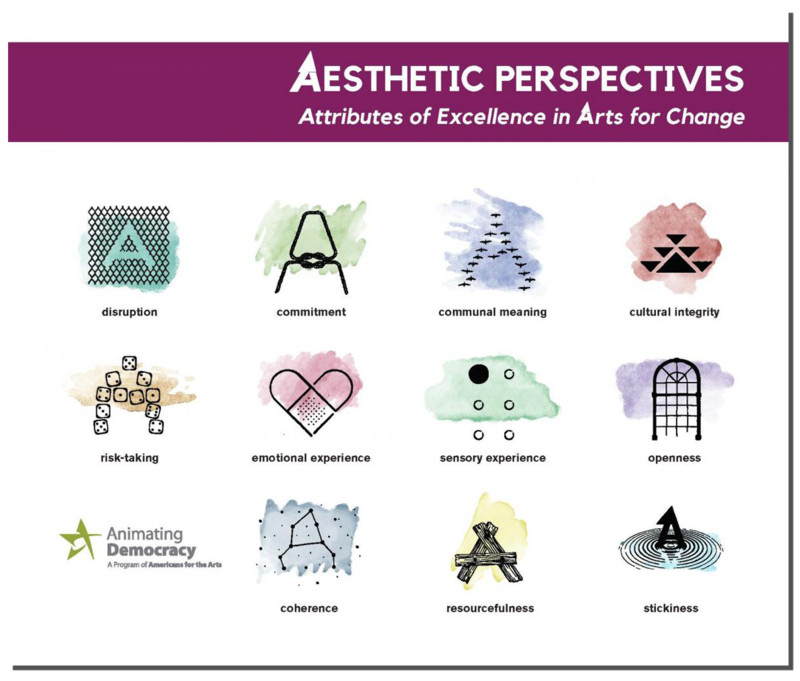 A poster for each of the 11 aesthetic attributes offers a VISUAL TOOL describing the attribute’s relationship to social justice and sample questions for use in teaching/training, funding panel processes, to guide dialogues and discussions of Arts for Change work.